A Sultry Redhead in Six Easy Steps! 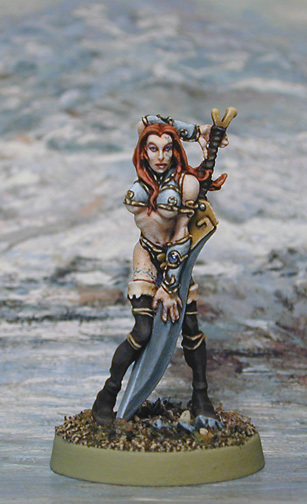 For this step-by-step guide I'm using one of Rackham's Keltoi female warriors. The better the sculpting of the face, the easier it is to paint, and these are very well done, with pronounced features that lend themselves to highlighting and detailing. I'm going to be painting her as a redhead, with auburn hair and pale skin. This shows roughly the colors used. They didn't scan very well; I adjusted to show the actual color as best as I could. All colors are Armory paints. After priming, the flesh areas have been basecoated with skin color 1 darkened with a tiny amount of hair color 1, thinned to the consistency of cream. The eye sockets and mouth are defined with brown ink (I use GW) on a fine brush. In this shot I have smoothed out the flesh with a solid, though thin, layer of color 1. This is the time to clean up around the eye socket, leaving a fine line of dark brown around the eyeball. I also leave this shadow color to form the eyebrows. I have also begun to layer on highlights with color 1 mixed with color 2. 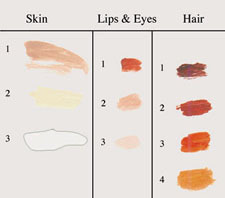 Areas that are hit by light, and thus should be painted a lighter color, are the cheekbones, the point of the chin, the bridge of the nose, the forehead, and the cleft of the upper lip. The sides of the nose, the area beneath the cheekbone, and the space beneath the lower lip remain in shadow. I am not really blending, but by keeping my paint thin and translucent, and the 'jump' between color transitions low, the result appears smooth to the eye. I have also painted the eyeball, using a stroke of white on a very fine brush. Here I have added the final highlight of color 3, almost pure white, to the bridge of the nose, the high point of the zygomatic arch, and the forehead over the arches of the eyebrows. I have also painted the lower lip and defined a cupid's bow on the upper lip, using color 1, and filled in the eye beneath the brow with the beginning flesh color. Her hair has been basecoated with color 1, again applied thinly. Her eyebrows have been defined with the same color on a fine brush. The hair has been painted with color 2 on a fine brush, leaving the darker color in the recesses to define the strands of hair. It has then been highlighted with color 3, as have the arches of her eyebrows. Final highlighting has been added to the top of the head and the ends of the hair strands with color 4. I may lighten them further after finishing her armour, but as I'm likely to get a smudge on them that will need repair at some point, I'm not picky about it now. And the finished figure. The rest of the body was painted with the same techniques and colors of the face. Tattoos were added with a blue Pigma Micron pen and, when dry, softened with a layer of the flesh highlight shades.